One prerequisite for using CCP and XCP as measurement and calibration protocol is the existence of an ASAP2 description file. The ASAP2 Tool-Set is used to create and check this file. The six programs that are started from the command line and are configured by initialization files. With the ASAP2 Studio you now have an additional convenient tool for entering and editing all information via a dialog-based user interface. Clear, dialog-based configuration and call of command line tools. Individual options can now be enabled/disabled in the dialogs and do not have to be written in the INI file. Support is provided for all new functions of ASAP2 version 1.7.1: for example, reading of signal data with data type "Half-Precision Floating Point" (Float16). The tools are available in both a 32-bit and a 64-bit version; ASAP2 Studio comes only in a 64-bit version. 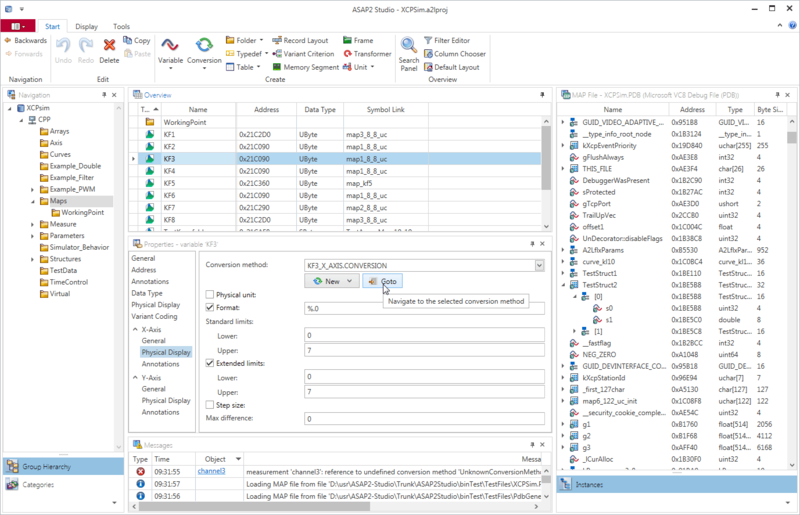 The ASAP2 Updater offers extended configuration options for generating new objects. New attributes were added to the filter options in ASAP2 Modifier.